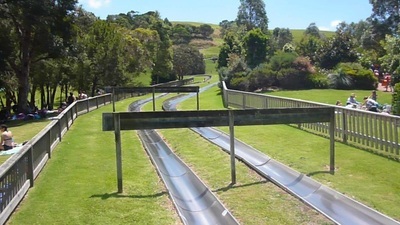 Last summer, I visited Jamberoo Action Park, a water-based theme park located a few hours south of Sydney that’s only open from September to April each year. It’s known for being "where you control the action". Or so the jingle goes. Well, while staying in nearby Kiama, I decided to put this claim to the test. 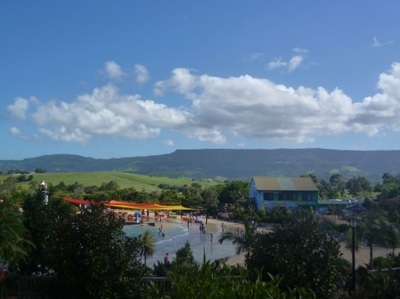 My group and I arrived at Jamberoo just after opening time (10.00am) and immediately dumped our lunch and towels in one of the huts near the entrance. It may seem unsafe, but everyone does it. I think people are too busy having fun to steal anything, but of course you shouldn't leave anything valuable behind. My first stop was The Rock, where you’re expected to jump into a pool from platforms either three or ten metres high. There’s no time to pump yourself up when there’s a line building up behind you. You just have to go. It probably would have been the best way to plunge into the day, but I decided I’d begin with the smaller slide next to these and work my way up. In the end, the slide was all I managed. I like to think I could have done the others (certainly, with everyone watching, it would have been hard to back out once I'd lined up) but I didn't bother. It was such a long line for such a short thrill - and it was one that didn't appeal to me anyway. 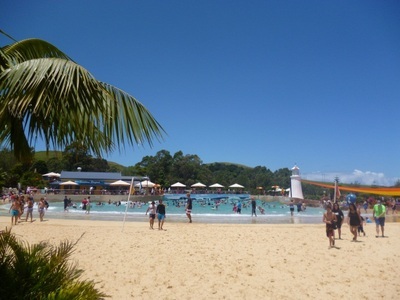 Instead, I headed to the wave pool in Outback Bay, which is located right next to the park entrance. At first I didn’t understand the point of this attraction. After all, the fun of waves usually comes from surfing them, not standing there as they knock you about. But as I moved deeper into the water I found that mastering the swell was pretty satisfying, as you crouch down in the troughs and then push off to rise with the waves until you can't touch the bottom. Even though the pool was packed, everyone was being thrown around at the same time and I was surprised to find I (rarely) hit anyone. I ended up out pretty deep so my legs sure got a work out. I'm not sure why the area is called Outback Bay though, as it has been made to look like a beach, as you would expect of a wave pool, with sand and beach chairs. When the water is calm, you can also swim here like in a regular pool. It turns out all the rides are pretty good. I also went on The Taipan, where an inflatable raft speeds down a dark tunnel and you can't tell when the next twist or fall is coming. Unfortunately I left my dress on (having just had lunch), since I had been told you don’t really get wet. But that must only apply to the other tunnel (there are two) because I certainly got soaked. Then there was the Wave Hill water slide, where you can race your friends down to the bottom, though whoever is the biggest seems to get the most momentum and win. Rapid River looked like it would hardly live up to its name, with people floating along on inflatable rings, but it's quite fun, though packed. You do have to dodge waterfalls and jets of water at some stages. Inevitably, I ended up soaked the entire day and it’s only reasonable that the park is shut between May and August. It probably wouldn't be that much fun in winter. But there are rides here that don't involve any water, such as the go-karts, bobsled and landscape golf. 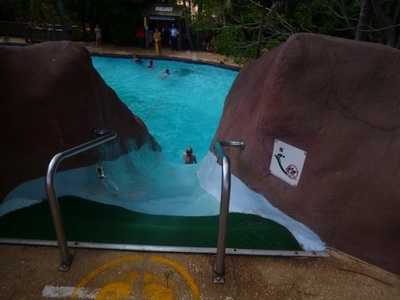 There are also areas specifically designed for kids, who will enjoy the miniature slides, a mushroom pool and Billabong Beach (a miniature park in itself). The entire park has a bright, fun, colouful atmosphere which families seem to flock to, most of them probably driving here from Sydney. Effort has been put into every little detail too, down to the trimming of the hedges, and when you look out over Jamberoo Valley, the view's pretty amazing. One of the only issues you'll come across is the lengthy lines, but they do move pretty fast. 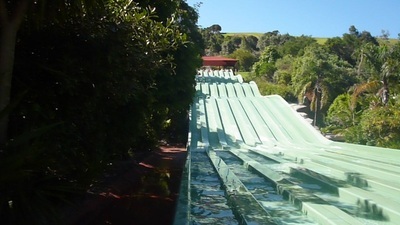 I guess my verdict is: Jamberoo Action Park is more than a tagline, it's a tagline with substance. There's so much to do here that you really are in control of the action. I think you'd be hard-pressed to fit everything in, so you will have to choose what kind of day you want: adrenalin-filled or relaxing, wet or (relatively) dry. 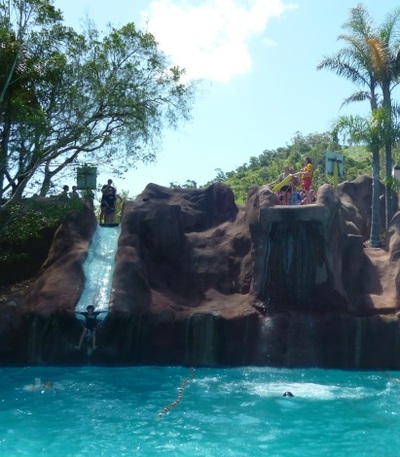 Since I've visited the park, two more attractions have opened: Banjo's Billabong, a four-storey structure with waterslides, bridges and more, and Funnel Web, the world's longest and biggest water ride. I think I might need to go try these out.